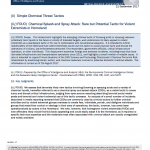 We assess that terrorists likely view tactics involving throwing or spraying acids and a variety of chemical liquids, hereafter referred to as a chemical spray and splash attack (CSSA), as a viable tactic to cause injury and disrupt critical infrastructure, judging from open source reporting describing terrorist social media posts and terrorist and violent extremist use of this tactic overseas. An analysis of a small number of incidents described in media reporting revealed that CSSAs are commonly used by criminal actors to further criminal activities and by violent extremist groups overseas to create fear, intimidate, punish, and disfigure individuals and groups that resist their control or ideology in their area of operations; the tactic, however, has rarely been operationalized by actors in the Homeland. 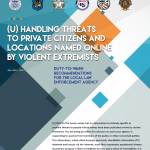 We note, however, that homegrown violent extremists (HVEs) and lone offenders likely would find this tactic appealing and could easily adapt it to the Homeland, as it requires no specific technical expertise and the materials most often associated with criminal attack are usually unregulated and widely available. 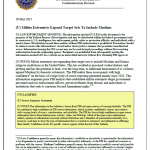 This Joint Intelligence Bulletin (JIB) prepared by the FBI and DHS is intended to provide law enforcement with a summary of significant domestic extremist incidents occurring during the previous 15 months. 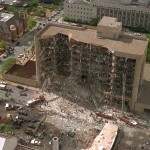 This product highlights the breadth and frequency of current domestic extremist threats against Homeland targets, and places them in the context of the 20th anniversary of the1995 bombing of the Alfred P. Murrah Federal Building in Oklahoma City, Oklahoma. This information is provided to support the activities of the FBI and DHS and to assist other federal, state, local, tribal, and territorial counterterrorism and law enforcement officials and private sector security officials in identifying existing or emerging threats to homeland security. Walter Bond’s path to animal rights extremism was driven by witnessing what he perceived as animal abuse and by frustration stemming from his perception that lawful, nonviolent actions appeared to have little impact on advancing the goals of the animal rights movement. 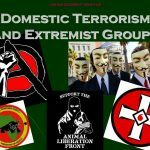 * Prior to becoming violent to advance animal rights, Bond showed a tendency to use violence to advance other beliefs, such as protesting illicit drug sales by committing arson against a drug trafficker’s home and protesting against religion by burning a pentagram symbol inside a church. Eight presentations used in the State and Local Anti-Terrorism Training (SLATT) program for law enforcement, which is supported by grants from the Department of Justice’s Bureau of Justice Assistance. Sovereign citizens believe the government is operating outside of its jurisdiction and generally do not recognize federal, state, or local laws, policies, or governmental regulations. They subscribe to a number of conspiracy theories, including a prevalent theory which states the United States Government (USG) became bankrupt and began using citizens as collateral in trade agreements with foreign governments. They believe secret bank accounts exist at the United States (US) Department of the Treasury. These accounts can be accessed using Internal Revenue Service (IRS), Universal Commercial Code (UCC), and fraudulent financial documents. Law enforcement and government officials for decades have understood the critical importance of building relationships, based on trust, with the communities they serve. Partnerships are vital to address a range of challenges and must have as their foundation a genuine commitment on the part of law enforcement and government to address community needs and concerns, including protecting rights and public safety. In our efforts to counter violent extremism, we will rely on existing partnerships that communities have forged with Federal, State, and local government agencies. This reliance, however, must not change the nature or purpose of existing relationships. In many instances, our partnerships and related activities were not created for national security purposes but nonetheless have an indirect impact on countering violent extremism (CVE). 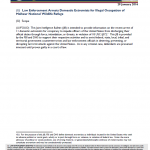 A US Government interagency study of homegrown violent extremists (HVEs) revealed four major mobilizing patterns shared by a majority of HVE cases between 2008 and 2010, providing officials with an emerging picture of distinct behaviors often associated with an individual mobilizing for violence. 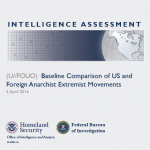 These four patterns—links to known extremists, ideological commitment to extremism, international travel, and pursuit of weapons and associated training—repeatedly appeared in the case studies, reinforcing initial assessments of potential trends. 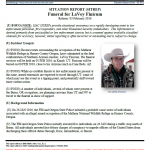 Awareness of the patterns can help combat the recent rise in these cases while providing a data-driven tool for assessing potential changes in the HVE threat to the Homeland. 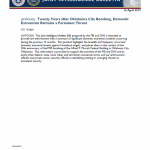 This Joint Intelligence Bulletin (JIB) updates a DHS-FBI joint analytic product of the same title dated 3 September 2010 and is intended to provide warning and perspective regarding the scope of the potential terrorist threats to the United States, specifically towards US persons. This product is provided to support the activities of DHS and FBI and to help federal, state, and local government counterterrorism and law enforcement officials deter, prevent, preempt, or respond to terrorist attacks directed against the United States. Insiders often possess detailed operational and system-security knowledge, as well as authorized physical and systems access to utilities. Insiders can be employees, contractors, service providers, or anyone with legitimate access to utility systems. They often are self-motivated, know system security measures, and raise no alarms due to their authorized systems access. With knowledge of and access to a utility’s network, malicious actors could seize control of utility systems or corrupt information sent to plant operators, causing damage to plant systems and equipment. Systems and networks used by utilities are potential targets for a variety of malicious cyber actors. Threat actors who target these systems may be intent on damaging equipment and facilities, disrupting services, stealing proprietary information, or other malicious activities. The greater the individual’s knowledge and authorized systems access, the greater risk the individual poses. Furthermore, any individual with access to a plant’s systems could unwittingly or inadvertently introduce malware into a system through portable media or by falling victim to socially engineered e-mails. The DBT Report is a stand-alone threat analysis to be used with the Physical Security Criteria for Federal Facilities: An ISC Standard. The document establishes a profile of the type, composition, and capabilities of adversaries, and it is also designed to correlate with the countermeasures in the compendium of standards and to be easily updated as needed. The DBT is an estimate of the threats that face Federal facilities across a range of undesirable events and based on the best intelligence information, Intelligence Community (IC) reports and assessments, and crime statistics available to the working group at the time of publication. Users of the DBT must consider that undiscovered plots may exist, adversaries are always searching for new methods and tactics to overcome security measures, and the lone-wolf adversary remains largely unpredictable. 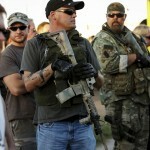 The National Socialist Movement (NSM) USPER is the most active neo-Nazi group operating in the United States. It has grown from a small organization with a limited following confined to the mid-western United States to the preeminent National Socialist group in the nation. Despite having recently suffered a defection of several regional leaders, NSM remains an influential force within white supremacist circles and the only major racist group that eschews all attempts to distance its methods and objectives from those of the Third Reich. NSM has a reputation for conducting numerous public rallies that have triggered a violent response, including a riot in Toledo, Ohio, in October 2005. The Vigilance Project is a comprehensive, analytic report that examines major terrorism cases that have taken place against the Homeland since September 11, 2001. 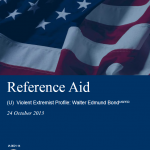 The report serves as a historical compilation of acts or attempted acts of terrorism against the United States, or its interests, and as a tool to identify trends and commonalities among the cases and the subjects involved. It is recognized that the threat environment is dynamic and potential threats are not limited to the findings contained in this report. As the title suggests, it is the duty of every citizen to remain vigilant in the face of terrorism. The findings of this report allow readers to gain an understanding of terrorism participants, their tactics and procedures, and become aware of similarities among the cases, in order to draw useful conclusions. The ultimate goal of the Vigilance Project is to provide useful information to law enforcement partners to support their role in preventing the next attack. As the President said in his State of the Union address, in the face of violent extremism, “we are responding with the strength of our communities.” A vast majority of people in every American community resoundingly reject violence, and this certainly includes the violent, al-Qaeda-style ideology that claims to launch attacks in the name of their widely rejected version of Islam. 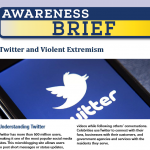 We must use these facts as a tool against the threat of homegrown violent extremism. In conjunction with these communities and with the Department of Justice and the Program Manager for the Information Sharing Environment, we have published guidance on best practices for community partnerships, which has been distributed to local law enforcement across the country. DHS also holds regular regional meetings – which include state and local law enforcement, state and local governments, and community organizations – in Chicago, Detroit, Los Angeles, and Minneapolis. These regional meetings have enabled participants to provide and receive feedback on successful community-oriented policing and other programs aimed at preventing violence.